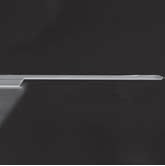 The cantilever is a key element of any scanning probe microscope, the properties and quality of which depends on the successful operation of the microscope in General. This is the basic measuring element of many types of probe microscopes. The right choice of the cantilever is one of the most important conditions for obtaining good AFM images. The most important component of AFM (Atomic force microscope) are the scanning probes of the cantilevers. The cantilever is a flexible beam (175х40х4 µm — average data) with a certain stiffness coefficient k (10-3 – 10 N/m), which is a micro needle. High Resolution Silicon AFM Cantilevers NSG01 series.are designed for Semicontact ( Intermittent ), Noncontact applications. Typical Resonant Frequency 150 kHz (guaranteed range 87-230kHz), Typical Force Constant 5.1 N/m (guaranteed range 1.45-15.1N/m). Cantilever has Au reflective side coating to increase laser signal. Probes are also available with no coating as well as with conductive tip coating. High Resolution Silicon AFM Cantilevers NSG03 series are designed for Semicontact ( Intermittent ), Noncontact applications. Typical Resonant Frequency 90 kHz (guaranteed range 47-150kHz), Typical Force Constant 1.74 N/m (guaranteed range 0.35-6.1N/m). Cantilever has Au reflective side coating to increase laser signal.Probes are also available with no coating as well as with conductive tip coating. High Resolution Silicon AFM Cantilevers NSG30 series.are designed for Semicontact ( Intermittent ), Noncontact applications. Typical Resonant Frequency 320 kHz (guaranteed range 240-440 kHz), Typical Force Constant 40 N/m (guaranteed range 22-100 N/m). Cantilever has Au reflective side coating to increase laser signal. Probes are also available with no coating as well as with conductive tip coating. TOP VISUAL High Resolution Semicontact / Noncontact Silicon AFM Cantilevers VIT_P/IR series are specially designed for tip or laser spot precise positioning over the point of interest. Typical Resonant Frequency 300 kHz (guaranteed range 200-400 kHz), Typical Force Constant 50 N/m (guaranteed range 25-95 N/m). Cantilevers have Au reflective coating. Probes are also available with no coating as well as with conductive tip coating. High Resolution High Resonant Frequency AFM Cantilevers HA_HR series are designed for Semicontact ( Intermittent ), Noncontact applications. Each probe has 2 rectangular cantilevers.Typical Resonant Frequency 380kHz / 230kHz (dispersion ±10%), Typical Force Constant 34N/m / 17N/m (dispersion ±20%). Cantilever has Au reflective side coating to increase laser signal. Probes are also available with no coating as well as with conductive tip coating. High Resolution High Resonant Frequency AFM Cantilevers HA_FM series are designed for Semicontact ( Intermittent ), Noncontact applications. Each probe has 2 rectangular cantilevers.Typical Resonant Frequency 114kHz / 77kHz (dispersion ±10%). Typical Force Constant 12N/m / 3.5N/m (dispersion ±20%). Cantilever has Au reflective side coating to increase laser signal. Probes are also available with no coating as well as with conductive tip coating. High Resolution Silicon AFM Cantilevers NSG10 series.are designed for Semicontact ( Intermittent ), Noncontact applications. Typical Resonant Frequency 240 kHz (guaranteed range 140-390kHz), Typical Force Constant 11.8 N/m (guaranteed range 3,1-37,6N/m). Cantilever has Au reflective side coating to increase laser signal.Probes are also available with no coating as well as with conductive tip coating. TOP VISUAL High Resolution Semicontact / Noncontact Silicon AFM Cantilevers VIT_P series are specially designed for tip or laser spot precise positioning over the point of interest. Typical Resonant Frequency 300 kHz (guaranteed range 200-400 kHz), Typical Force Constant 50 N/m (guaranteed range 25-95 N/m). Cantilevers have no coating. Probes are also available with Au reflective coating as well as with conductive tip coating. High Resolution High Accuracy AFM Cantilevers HA_NC series are designed for Semicontact ( Intermittent ), Noncontact applications. Each probe has 2 rectangular cantilevers.Typical Resonant Frequency 235kHz / 140kHz (dispersion ±10%). Typical Force Constant 12N/m / 3.5N/m (dispersion ±20%). Cantilever has Au reflective side coating to increase laser signal. Probes are also available with no coating as well as with conductive tip coating. High Resolution Silicon AFM Cantilevers CSG30 series are designed for Contact/noncontact applications. Typical Resonant Frequency 48 kHz (guaranteed range 26-76kHz), Typical Force Constant 0,6 N/m (guaranteed range 0,13-2N/m). Cantilever has Au reflective side coating to increase laser signal. Probes are also available with no coating as well as with conductive tip coating. High Resolution Silicon AFM Cantilevers CSG01 series are designed for Contact applications. Typical Resonant Frequency 9,8 kHz (guaranteed range 4-17kHz), Typical Force Constant 0,03 N/m (guaranteed range 0,003-0,13N/m). Cantilever has Au reflective side coating to increase laser signal. Probes are also available with no coating as well as with conductive tip coating. 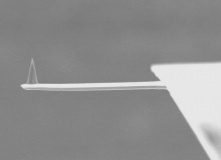 Contact Mode AFM probes CSG11 series. Each chip has 2 rectangular cantilevers, typical resonant frequency 21kHz/ 11kHz, force constant 0.1N/m / 0.05N/m. Cantilever has Au reflective side coating to increase laser signal. TOP VISUAL High Resolution Contact Silicon AFM Cantilevers VIT_P_C-A series are specially designed for tip or laser spot precise positioning over the point of interest. Typical Resonant Frequency 16 kHz (guaranteed range 8-25 kHz), Typical Force Constant 0.3 N/m (guaranteed range 0.06-1N/m). Cantilevers have Al reflective coating. High Resolution AFM Cantilevers HA_C series are designed for Contact mode and Lateral Force Mode applications. Each probe has 2 rectangular cantilevers.Typical Resonant Frequency 37kHz / 19kHz (dispersion ±10%). Typical Force Constant 0.65N/m / 0.26N/m (dispersion ±20%). Cantilever has Au reflective side coating to increase laser signal. Probes are also available with no coating as well as with conductive tip coating. High Resolution Silicon AFM Cantilevers CSG10 series are designed for Contact applications. Typical Resonant Frequency 22 kHz (guaranteed range 8-39kHz), Typical Force Constant 0,11 N/m (guaranteed range 0,01-0,5N/m). Cantilever has Au reflective side coating to increase laser signal. Probes are also available with no coating as well as with conductive tip coating. High Resolution Silicon AFM Cantilevers FMG01 series are designed for Force Modulation applications. Typical Resonant Frequency 60 kHz (guaranteed range 40-96kHz), Typical Force Constant 3 N/m (guaranteed range 1-5N/m). Cantilever has Au reflective side coating to increase laser signal. Probes are also available with no coating as well as with conductive tip coating. High Resolution Silicon AFM Cantilevers NSG30/Au series are designed for Conductive applications. Typical Resonant Frequency 320 kHz (guaranteed range 240-440kHz), Typical Force Constant 40 N/m (guaranteed range 22-100N/m). Cantilever has Au reflective side coating to increase laser signal. High Resolution Silicon AFM Cantilevers NSG03/Au series are designed for Conductive applications. Typical Resonant Frequency 90 kHz (guaranteed range 47-150kHz), Typical Force Constant 1,74 N/m (guaranteed range 0,35-6,1N/m). 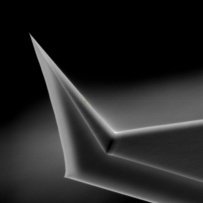 Cantilever has Au reflective side coating to increase laser signal. High Resolution Silicon AFM Cantilevers CSG01/Au series are designed for Conductive applications. Typical Resonant Frequency 9,8 kHz (guaranteed range 4-17kHz), Typical Force Constant 0,03 N/m (guaranteed range 0,003-0,13N/m). Cantilever has Au reflective side coating to increase laser signal. High Resolution Silicon AFM Cantilevers FMG01/Au series are designed for Conductive applications. Typical Resonant Frequency 60 kHz (guaranteed range 40-96kHz), Typical Force Constant 3 N/m (guaranteed range 1-5N/m). Cantilever has Au reflective side coating to increase laser signal. High Resolution Silicon AFM Cantilevers CSG01/Pt series are designed for Conductive applications. Typical Resonant Frequency 9,8 kHz (guaranteed range 4-17kHz), Typical Force Constant 0,03 N/m (guaranteed range 0,003-0,13N/m). Cantilever has PtIr tip and reflective sides coating. High Resolution Silicon AFM Cantilevers NSG10/Au series are designed for Conductive applications. Typical Resonant Frequency 240 kHz (guaranteed range 140-390kHz), Typical Force Constant 11,8 N/m (guaranteed range 3,1-37,6N/m). Cantilever has Au reflective side coating to increase laser signal. High Resolution Silicon AFM Cantilevers NSG03/Pt series are designed for Conductive applications. Typical Resonant Frequency 90 kHz (guaranteed range 47-150kHz), Typical Force Constant 1,74 N/m (guaranteed range 0,35-6,1N/m). Cantilever has PtIr tip and reflective sides coating. High Resolution Silicon AFM Cantilevers NSG30/Pt series are designed for Conductive applications. Typical Resonant Frequency 320 kHz (guaranteed range 240-440kHz), Typical Force Constant 40 N/m (guaranteed range 22-100N/m). Cantilever has PtIr tip and reflective sides coating. High Resolution Silicon AFM Cantilevers CSG10/Au series are designed for Conductive applications. Typical Resonant Frequency 22 kHz (guaranteed range 8-39kHz), Typical Force Constant 0,11 N/m (guaranteed range 0,01-0,5N/m). Cantilever has PtIr reflective side coating to increase laser signal. High Resolution Silicon AFM Cantilevers NSG01/Au series are designed for Conductive applications. Typical Resonant Frequency 150 kHz (guaranteed range 87-230kHz), Typical Force Constant 5,1 N/m (guaranteed range 1,45-15.1N/m). Cantilever has Au reflective side coating to increase laser signal. High Resolution Silicon AFM Cantilevers CSG10/Pt series are designed for Conductive applications. Typical Resonant Frequency 22 kHz (guaranteed range 8-39kHz), Typical Force Constant 0,11 N/m (guaranteed range 0,01-0,5N/m). Cantilever has PtIr tip and reflective sides coating. High Resolution Silicon AFM Cantilevers NSG01/Pt series are designed for Conductive applications. Typical Resonant Frequency 150 kHz (guaranteed range 87-230kHz), Typical Force Constant 5.1 N/m (guaranteed range 1,45-15,1N/m). Cantilever has PtIr tip and reflective sides coating. High Resolution Silicon AFM Cantilevers FMG01/Pt series are designed for Conductive applications. Typical Resonant Frequency 60 kHz (range 35-90kHz), Typical Force Constant 1.6 N/m (guaranteed range 0.8-3.0N/m). Cantilever has PtIr tip and reflective sides coating. 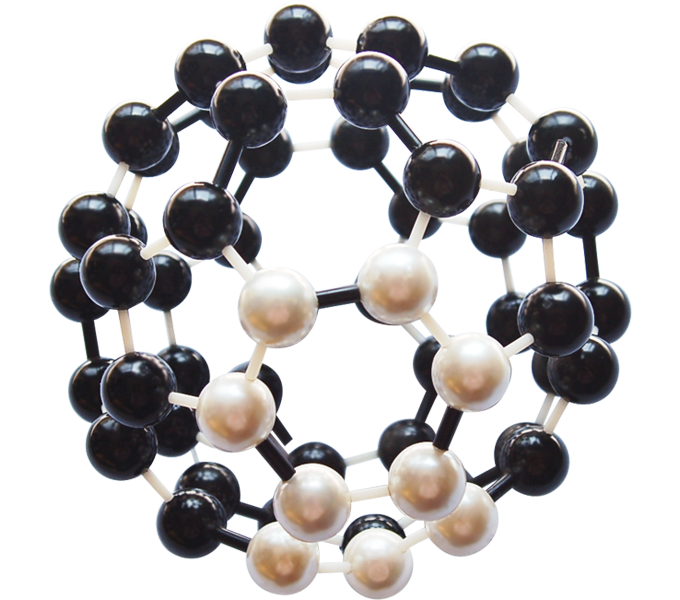 High Resolution Silicon AFM Cantilevers CSG01/TiN series are designed for Conductive applications. Typical Resonant Frequency 9,8 kHz (guaranteed range 4-17kHz), Typical Force Constant 0,03 N/m (guaranteed range 0,003-0,13N/m). Cantilever has Au reflective side coating to increase laser signal. Noncontact/Semicontact Conductive Probes NSG03n/TiN series with TiN tips coating. Resonant frequency 62-123 kHz, force constant 0,4-2,7 N/m. Cantilever has Au reflective side coating to increase laser signal. Noncontact/Semicontact Conductive Probes NSG01n/TiN series with TiN tips coating Resonant frequency 115-190 kHz, force constant 2,5-10 N/m. Cantilever has Au reflective side coating to increase laser signal. Noncontact/Semicontact Conductive Probes NSG10n/TiN series with TiN tips coating. Resonant frequency 190-325 kHz, force constant 5,5-22.5 N/m. Cantilever has Au reflective side coating to increase laser signal. In comparison with NSG10/TiN probes NSG10n/Tin probes have bigger chip size, slight difference in lever parameters and keep stable condutivity on freshly cleaved HOPG till applied voltage ± 3V. High Resolution High Resonant Frequency AFM Cantilevers HA_FM/Au series are designed for Semicontact ( Intermittent ), Noncontact and electrical applications (SKM, SCM, SRIM, EFM, LAO Lithography). Each probe has 2 rectangular cantilevers.Typical Resonant Frequency 114kHz / 77kHz (dispersion ±10%). Typical Force Constant 12N/m / 3.5N/m (dispersion ±20%). Cantilever has Au tip and reflective side coatings. Probes are also available without tip coating. High Resolution AFM Cantilevers HA_C/Pt series are designed for Contact, Lateral Force and electrical applications. Each probe has 2 rectangular cantilevers. Typical Resonant Frequency 37kHz / 19kHz (dispersion ±10%). Typical Force Constant 0.65N/m / 0.26N/m (dispersion ±20%). Cantilever has Au reflective and Pt tip side coatings. Probes are also available with no tip coating. High Resolution High Resonant Frequency AFM Cantilevers HA_HR/Pt series are designed for Semicontact ( Intermittent ), Noncontact and electrical applications (SKM, SCM, SRIM, EFM, LAO Lithography). Each probe has 2 rectangular cantilevers.Typical Resonant Frequency 380kHz / 230kHz (dispersion ±10%), Typical Force Constant 34N/m / 17N/m (dispersion ±20%). Cantilever has Au reflective and Pt tip side coatings. Probes are also available without tip coating. High resolution long lifetime magnetic probes. These probes allow to carry out both ordinary measurements with high accuracy and resolution to 20-30nm (MFM01, MFM10) and the measurements with special requirements such as the experiments in high external fields (MFM_HC) and imaging low coercive magnetic samples (MFM_LM). High Resolution Silicon AFM Cantilevers MFM10 and MFM01 series.are specially designed for work in magnetic AFM mode (MFM). Due to optimized coating thickness these probes suit for different magnetic samples and are recommended for initial measurements of new samples. Upon reviewing the results you can take a decision if the MFM coating used is the appropriate one or it is better to try another type of magnetic coating. Due to special defensive layers which prevent the ferromagnetic tip coating from oxidizing, all MFM probes have a long shelf life, and the small tip curvature radius enables you to obtain good high resolution images. Typical Resonant Frequency of the probes 150 kHz (guaranteed range 87-230kHz), typical Force Constant 5.1 N/m (guaranteed range 1.45-15.1N/m). Cantilever has Al reflective side coating to increase laser signal. High Coercivity Magnetic High Resolution Silicon AFM Cantilevers MFM_HC series are specially designed for MFM measurements in high external magnetic fields. MFM_HC probes have coercivity 500-800Oe in vertical direction and more than 2kOe in horizontal direction. Their coating based on Co high coercivity alloy guarantees the stable parameters of magnetic probe under the influence of the external magnetic field during measurement. Due to special defensive layers which prevent the ferromagnetic tip coating from oxidizing, all MFM probes have a long shelf life, and the small tip curvature radius enables you to obtain good high resolution images. Typical Resonant Frequency of the probes 70 kHz (guaranteed range 47-90kHz), typical Force Constant 3N/m (guaranteed range 1-5N/m). Cantilever has Al reflective side coating to increase laser signal. High Resolution High Resonant Frequency AFM Cantilevers HA_FM series are designed for Magnetic, Semicontact ( Intermittent ), Noncontact applications. Each probe has 2 rectangular cantilevers.Typical Resonant Frequency 114kHz / 77kHz (dispersion ±10%). Typical Force Constant 12N/m / 3.5N/m (dispersion ±20%). Cantilever has Au reflective and CoFe tip side coatings. Probes are also available without tip coating. Guaranteed lifetime is within 3 months. Low Moment Magnetic High Resolution Silicon AFM Cantilevers MFM_LM series.are specially designed for work in magnetic AFM mode (MFM) with low coercive magnetic samples. MFM_LM probes have thinner magnetic coating than ordinary magnetic tips. So, such low coercive magnetic samples as iron garnet films, ordered array of interaсting Co particles, ordered array of vertically magnetized 35nm CoPt dots can be measured (see MFM images obtained by MFM_LM probes in the pictures bar). Thanks to their own low magnetic fields low moment MFM_LM probes allow to decrease the probe influence on the researched sample while scanning. Due to special defensive layers which prevent the ferromagnetic tip coating from oxidizing, all MFM probes have a long shelf life, and the small tip curvature radius enables you to obtain good high resolution images. Typical Resonant Frequency of the probes 70 kHz (guaranteed range 47-90kHz), typical Force Constant 3N/m (guaranteed range 1-5N/m). Cantilever has Al reflective side coating to increase laser signal. High Resolution Silicon AFM Cantilevers MFM01 series.are specially designed for work in magnetic AFM mode (MFM). Due to optimized coating thickness these probes suit for different magnetic samples and are recommended for initial measurements of new samples. Upon reviewing the results you can take a decision if the MFM coating used is the appropriate one or it is better to try another type of magnetic coating. Due to special defensive layers which prevent the ferromagnetic tip coating from oxidizing, all MFM probes have a long shelf life, and the small tip curvature radius enables you to obtain good high resolution images. Typical Resonant Frequency of the probes 70 kHz (guaranteed range 47-90kHz), typical Force Constant 3N/m (guaranteed range 1-5N/m). Cantilever has Al reflective side coating to increase laser signal. Tipless Semicontact / Noncontact Conductive Probes NSG11/tipless series. Each chip has 2 rectangular cantilevers, typical resonant frequency 255kHz/ 150kHz, force constant 11.5N/m / 5,5N/m. Cantilevers has Au reflective side coating to increase laser signal. Tipless High Accuracy AFM Cantilevers HA_C series are designed for Contact mode and Lateral Force Mode applications. Each probe has 2 rectangular cantilevers.Typical Resonant Frequency 37kHz / 19kHz (dispersion ±10%). Typical Force Constant 0.65N/m / 0.26N/m (dispersion ±20%). Cantilever has Au reflective side coating to increase laser signal. New convenient format for probe puchasing. Cantilever sets which include different probe series for research of different samples by various AFM modes. Personal Mixed Cantilever Set of 50 pieces GOLDEN probes is completed in accordance with customer’s needs. Personal Mixed Cantilever Set of 50 pieces ETALON probes is completed in accordance with customer’s needs. ・5 chips – for MFM. Set of 15 High Resolution long lifetime magnetic probes. Set is intended for MFM measurements of different magnetic samples to find the best probes parameters for better imaging. MFM01, MFM_LM – 3 N/m (guaranteed range 1-5 N/m). MFM10 – 5.1 N/m (guaranteed range 1.45-15.1N/m). Detailed specification see using the links: MFM01, MFM10, MFM_LM. Cantilevers has Al reflective side coating to increase laser signal. The probe complectation can be different upon customers’ request.